Used to hold an error-details.txt template in ram. An error-details,.txt is represented by a list of error detail entries (ErrorDetailEntry objects). Definition at line 38 of file ErrorDetailManager.h. Definition at line 51 of file ErrorDetailManager.h. Definition at line 41 of file ErrorDetailManager.h. Definition at line 59 of file ErrorDetailManager.cc. 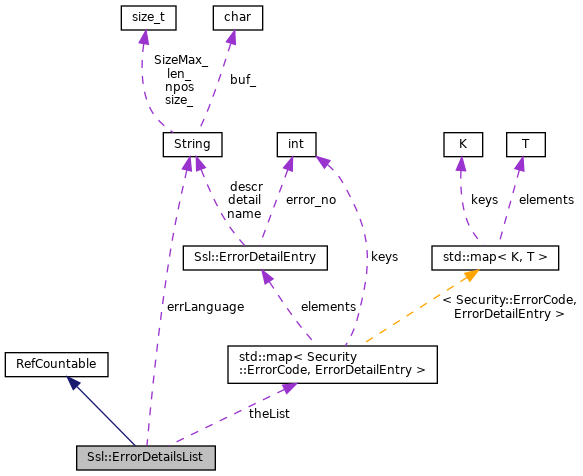 Definition at line 70 of file ErrorDetailManager.cc. Definition at line 45 of file ErrorDetailManager.cc. References Ssl::ErrorDetailEntry::descr, Ssl::ErrorDetailEntry::detail, Ssl::ErrorDetailEntry::error_no, and Ssl::ErrorDetailEntry::name. Definition at line 50 of file ErrorDetailManager.h. Definition at line 52 of file ErrorDetailManager.h.